Ages 4 through adult. This CD features communication boards and picture symbols that you can print out for distribution to students. 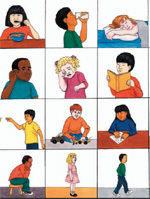 The CD includes our 8-page, full-color Communication Board Picture Book, a variety of black and white vocabulary boards, and reproducible black and white picture symbol pages that you can print out for use in instruction. Food, furniture, school items, articles of clothing, and other items are displayed. All pages can be printed out as PDF files on IBM or Mac computers.